She was born Cyrena Pocock. She studied singing at the Cincinnati conservatoire under the pedagogue Louise Dotti. In 1913 she was engaged by the conductor Cleofonte Campanini for the Chicago Opera, where she made her debut in 1913 as Amneris in ‘’Aida’’. On 26. 12. 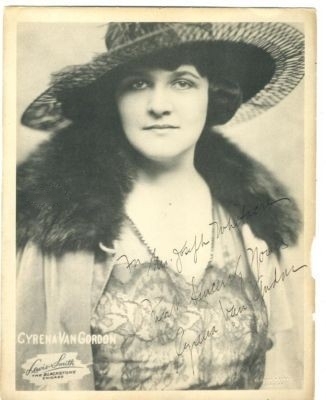 1917 she appeared there in the premiere of the opera ‘’Azora’’ by Henry Hadley. In 1921 she sang at the same opera house the part of Brünnhilde in ‘’Walküre’’, however, this remained the only soprano part of the singer. On 4. 11. 1929 she appeared in the opening performance of the new opera house Chicago Opera in a gala performance of G. Verdi’s ‘’Aida’’ (as Amneris). At the Chicago Opera her repertoire included Ortrud in ‘’Lohengrin’’, Fricka, Erda, Marina in ‘’Boris Godunov’’ (1920, with Fedor Schaljapin), Dalila in ‘’Samson et Dalila’’, Ulrica in ’’Ballo in maschera’’, Azucena in ‘’Trovatore’’ and Principessa in ‘’Suor Angelica’’. In 1933 she joined for a season to the Metropolitan Opera in New York, where she performed as Amneris in ‘’Aida’’ as the only role. At the Philadelphia Opera she sang among other things in 1935 in the American première of the opera ‘’Iphigénie en Aulide’’ by Gluck. Later she had her residence in New York, where she still been active as pedagogue.